Lambton County Archives: History from the Vault: Where Did Our Collection Come From? The Lambton Room had an interesting beginning, and here I will provide you with a brief glimpse into the genesis of our collection. The idea to begin a "history room" for the county began in 1974, when Mrs. Marion Ellwood (a librarian in Mandaumin ) committed her Tuesday and Thursday mornings to the organization of a "old pictures of buildings, streets and historic events" in a small room in Wyoming. The collection would receive a huge boon in 1975 with the purchase of the George Smith Collection. The George Smith Collection contained original material significant to the history of the county. When it was purchased in the mid-1970s, county librarian Ron Baker was confronted with a staggeringly large and historically deep collection of material. It contained original correspondence, maps, photographs, government documents, and biographies of significant Lambton County figures. Paper clipping from the Sarnia Gazette, August 6, 1975. A gem nestled in the George Smith Collection was over 50,000 negatives from the Observer snapped between 1949 and 1970. Legend has it the Observer threw out the negative collection due to a space shortage, and George Smith bravely fished them out of a dumpster to preserve them for future generations. The Observer negatives have been indexed and are in the process of being cleaned and scanned, so they will be properly preserved and readily available online through the Lambton County Museums Catalogue. 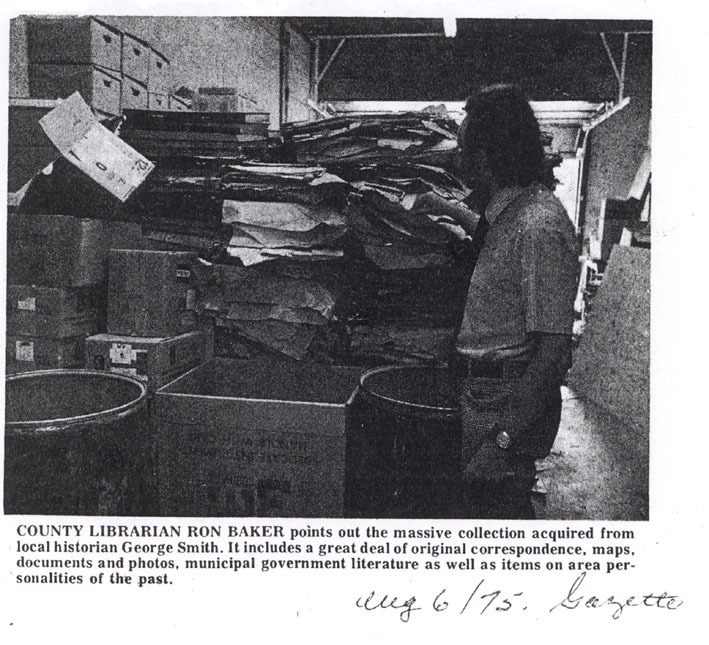 Librarian Ron Baker devised a cataloging system to organize the records and increase accessibility. His index organizes records by category, and remains in use to this day, although some additions have been made to accommodate new topics. In January 1976, the Ted Phelps Collection was also purchased. It contained 36 boxes of documents, clippings and photographs, and combined with the weight of the George Smith Collection, formed a formidable and impressive record of Lambton County's history. The foundation provided by those two collections has been fleshed out by acquisitions and generous donations over the last three decades. The Lambton Room has acquired more space and more donations over the years but stays true its original vision of acquiring, organizing, and preserving the history of Lambton County.